Edge Sight and Sound - your events. our passion. : University of Tulsa Homecoming 2009!! As a TU alum, owner Kenneth Knoll is a proud supporter of the University of Tulsa. Edge Sight & Sound was honored to serve as a sponsor of this year's annual homecoming week. 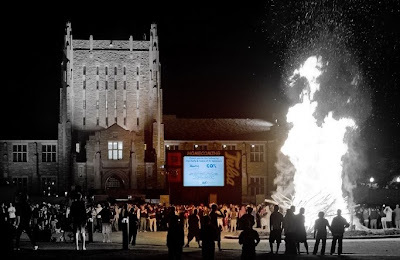 Service donations included audio and video support for the Bonfire celebration held on the historic Tulsa "U" just west of the McFarlin Library. We now offer more than the best DJ services around for weddings, corporate events and private parties; the next time you are planning a large event requiring professional audio, video and event lighting design, trust us to cover every aspect of the event!